During the holidays I'm constantly in need of hostess gifts, stocking stuffers, and small gestures for coworkers. I like to create things I can make in large batches and keep it affordable but thoughtful. Last year, I made some lavender sugar scrubs which were a big hit and fun to make. This year, I wanted to make a sweet treat. Inspired by the hot candied nuts at Chicago's German Christkindl Market, I thought I'd whip up a big batch to give out as a hostess gift for Kyle's mom for Thanksgiving (and of course plenty of leftovers for us). They were incredibly easy to make and the packaging really gave it a special touch - you won't believe where I found them! Get the Cinnamon Sugar Candied Almonds recipe here. I sadly can't take credit for dreaming up this tasty recipe, but do highly recommend it. So, I'll just direct you straight to the source. The hardest thing about this recipe is trying not to eat them all hot out of the oven directly off the baking sheet! What really gives this hostess gift a special touch is the packaging. I scored these adorable plaid drawstring bags from the dollar bin at Target! 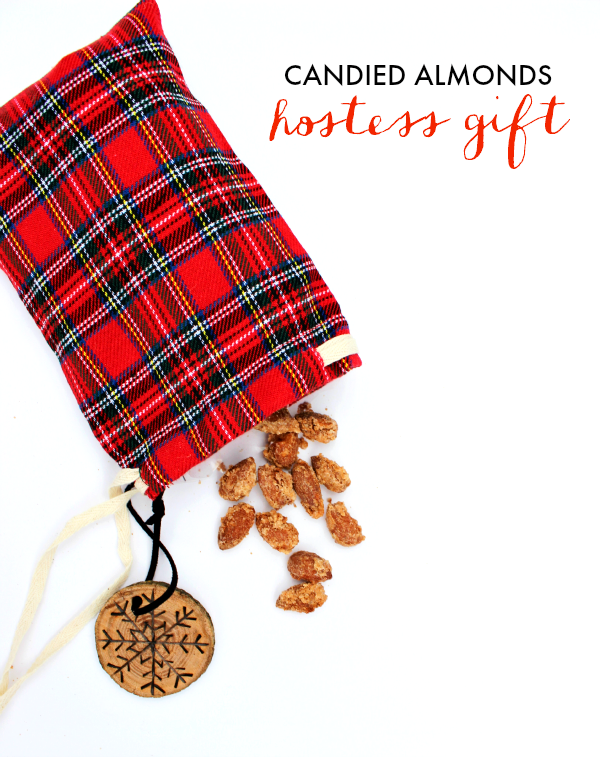 Just put the almonds in a clear treat bag & close to keep fresh, then, place in the cute plaid bag. I also attached one of the woodburned gift tags that Kyle made me (he's so handy!) to the bag. Just put the to & from on the opposite side! You could use the same idea to package up hot cocoa, coffee, or a candle for a small gift. I'm going to be spending this weekend getting some blog posts together with the best Black Friday deals & the launch of gift guides. Be sure to let me know what you're looking for and I'll do my best to make it happen! Wow! I think this will be a good party favor. I just got an idea. Thanks!